Your work must be your own creative design with label added to backside. Artists must be high school students and older. All artwork must be ready for professional exhibit installation. Works on paper, photographs, and other matted work must be securely framed. Artwork meant to hang on a wall must be equipped with picture wire. Clips, brackets or saw tooth hangers are not permitted. WFAF Committee reserves the right to accept or reject entries. No early release of work. 15% commission on sales go to WFAF. 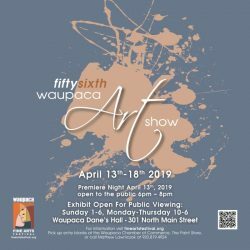 All award money will be sent via mail in a timely manner upon completion of the Waupaca Art Show. A $10 per day, per piece storage fee will be added for work picked up late. If left for longer than 2 weeks, the work will be considered a donation to WFAF.